Following a great year for the Hurlers the final hurdle proved too much and they were defeated by a stronger Crinkill side in Killurin GAA. The lads battled hard but it was not to be. 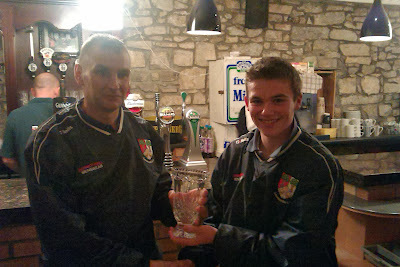 Seán Óg Farrell picked up the Man of the Match Award for the Reds and was presented by Oisin O'Grady in Foys Bar and Lounge where the team were treated to a meal courtesy of the Foy Family. Well done to Jimmy O'Grady and the team this year on a great achievement on reaching the final.